Let us take a look at the difference between this glass. Isn't that impressive? We are used to the fact that ordinary glass is a transparent and beautiful material. It is often possible to increase the amount of light and visible space by using glass in the design of the room. However, the glass with a low percentage of iron can noticeably excel the ordinary glass in these characteristics. From the name, it is obvious that the low iron glass is created by adding a smaller amount of iron. While iron is about 0.1% in ordinary glass, it is 10 times less in the super-transparent glass. Such a glass consists mainly of silica. 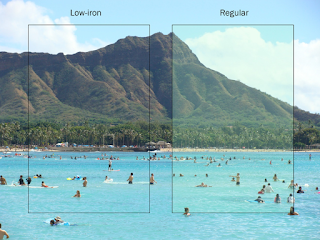 Low iron glass has wider spectral transparency. Due to this, the glass does not have a greenish tint, typical of ordinary glass. Colors are transmitted without distortion. Super transparent glass has one more advantage: it has a greater thermal resistance. This means that it expans less when being heated. Such glass will be especially particular with a large thickness. After all, the green edge of the usual clear glass is enhanced at the edges with increasing size and thickness. Low iron glass will be transparent and invisible regardless of thickness. Due to its properties, super-transparent glass is used as tables tops, for creating shop windows and doors, for making aquariums, windows, etc. Such a table covering will look neutral and will not distort the color of the furniture. The reason for using the glass, which has the low percentage of iron, in decorating shops and shopping centers is the desire to fill the interiors with natural light and create a bright, open and unlimited space. With the same purpose, it is possible to install windows from such glass at home. It will bring special pleasure if there is a beautiful landscape outside the window. Such glass naturally and accurately conveys colors and lighting, filling the room with light.